I know that this sounds unnatural and most people will not even believe it, but I assure you that I do not tell an untruth here when I say that I sometimes actually forget to eat. Yep. It happens. I get engrossed in projects. I get super busy multitasking like a ninja, and before I know it, it is the end of the day, and I’ve missed breakfast, second breakfast, elevensies, pre-lunch, lunch, mid afternoon snack, tea time, cocktails… and dinner is looming. At these times, I really don’t even get hungry. Occasionally, if I pause, the stomach will growl and I will think, When did I last eat?However, if something further captures my attention… that thought generally flees before the SHINY only to be recalled at a much later time. Sometimes, I’ve been known to get through a day look at the clock and think, It’s too late to eat now, and I need to sleep. And so it goes… No, I’m not anorexic. One look and it will be obvious that I am not. When I do eat, I can generally put some food away. I do like food. It is just that eating frequently takes away from other things. When I enjoy food, it is planned meals and outings and times where the food is an event. Sounds odd, right? But for me, this is normal. Even as a child, I would tear up some breakfast, but especially during the summer, there was just too much to do for the rest of the day’s meals to be a priority. It was difficult for parents, grandparents, or anyone else to get me to come inside and eat throughout the day. But then… there are the down times. I don’t mean depression exactly. I mean literally nothing to do. Days where I have no plans and nothing to occupy my time and attention, I can (and have in the past) eat everything that isn’t nailed down. Even the cat becomes truly terrified. Turns out, I am an emotional eater. Boredom is an emotion, right? So, boredom it is. I get bored, I eat. Oh, if I am perfectly honest with myself and with all of you reading this, I eat for a lot of other emotions, too. I’m pretty sure of it. Perhaps I will delve into that little issue in another post, but for now, I’m going to talk about the boredom emotion and the impact it has on a tendency to eat when not hungry. I’m probably not the only one that has this particular failing. 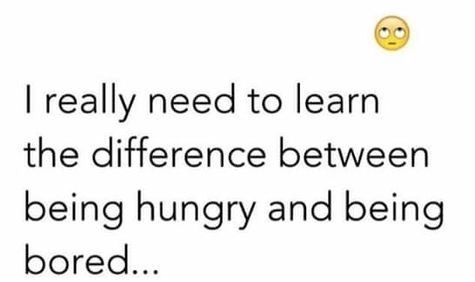 Too many people today confuse boredom with hunger. In my case, I actually know the difference. When I stand looking in the refrigerator or pantry for hours and nothing looks appealing but I grab something anyway only to chuck away an empty container feeling unsatisfied. That wasn’t it. If I consciously take stock while I stand there staring at Inspiration Point (the space in front of said refrigerator or pantry) longingly looking for the food item that will satisfy the craving, I will realize, usually, that I’m not hungry. Not in the least. So, what am I doing? I’m trying to fill something else. Time? So, provided I am not on autopilot, I can usually close the door to whatever receptacle or storage compartment and walk away. Better yet, I can go find a project or a book or a computer game or go to the gym, anything, in fact, that will occupy my mind and body with something that isn’t mindless eating… just because there is nothing better to do. I can take it from my younger self, back when I had limitless imagination and energy. There is ALWAYS something better to do. I know that my family and friends get annoyed with my myriad of projects and sidelines and even taking second jobs on occasion (maybe more about that in TNC post later), but when it comes to my health, diet, and body image, that boredom character is my greatest foe. The best way I know to combat it is to keep busy. If you are reading this and find that boredom is trying to sabotage your efforts to eat more mindfully and make healthier choices, find a new hobby, keep a list of activities. If you find yourself standing at Inspiration Point staring at a bunch of food and not “feeling” any of them, shut the door, turn around, go for a walk (or a run, or do some yoga…). Do not let the saboteur win. Here endeth the lesson… just kidding. This lesson will never end for me, but I will keep on fighting it.